I need a design done in Adobe Illustrator of a parody of the Ikea store instruction man. 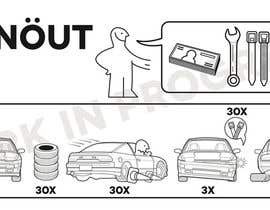 You know the instructions you get with any Ikea piece of furniture? I have taken inspiration from another tee shirt that I have attached. 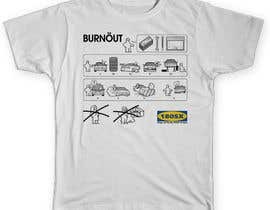 I am showing the Ikea man buying a drift racing car and going through the steps of owning and racing a drift car. Showing this in picture form like the instructions. I have done the rough sketch that is attached. I really just need someone to do the illustrations, they MUST be styled exaclty as an Ikea instructions are done. Just very basic line drawings with small detail to the car so you can tell that it is a Nissan 180sx. I have attached images of the car so you have an idea of what they look like. Please make sure it looks the same through all the pictures. I would like the car styled a little, so its sits lower etc. 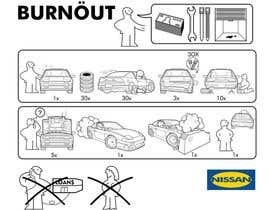 The Ikea man will be in some varying positions and in the car. Stack of money, spanner, zip ties and a car garage. The car garage should have the door 3/4 down and and small oil spill on the floor. 1. Ikea man next to the Nissan 180sx, (front view) he is smiling and the car is brand new. Maybe like a sparkle showing the car is fresh and new. Next to it will be a stack of car tyres. 2. Next picture is of the car that has sliden sideways and hit a traffic cone that fell over. (3/4 view from the rear right) The Ikea man will have a confused look on his face and is driving the car. If you can have him with his hands on the steering wheel and his head out the window. 3. Next picture is the car from the front view with the front bumper bar fallen off on the right side Like it has been smashed. I have attached an image helping with this. 4. 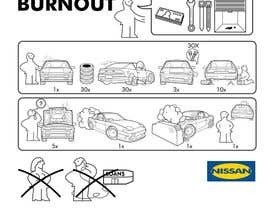 Next is a picture of the car (rear view) sitting on car stands and both rear tyres are off, the Ikea man is changing the wheel on the right. He has a sad and angry look on his face. [login to view URL] man standing next to the car (front view) The cars bonnet is up (I ahve attahced an image so you know what the bonnet looks like up in a Nissan180sx and there is small smoke lines coming from the engine like it is broken down. The Ikea man has a confused look and a question mark coming from him like the Ikea instructions. 2. Car is drifting (sliding sideways) (3/4 view from front right) I have attached an image of how it will look. Smoke coming from the rear tyres like or close to my illustration. Ikea man is driving the car smiling. 3. Car is crashed (view front 3/4 front right) crashed into a concrete barrier. bonnet has folded up like crashed cars do, smoke is coming up, debris is on the ground. other damage to guards and front. Ikea man is sad. Inside the car or head outside the window. 4. Ikea man is sad standing there with his pockets out cause he is broke. Car is in the background, (rear view) smoke coming from the front, tyres are flat. 2. Ikea man calling the bank just like the instructions attached. But it says Loans and a dollar sign on the building. hahaha Damn nice mate, I'll start doing it right now.